Nestled on the 10th floor of Ocean’s Edge in the quaint town of Singer Island, Florida is this 4 bedroom, 4.5 bathroom oceanfront condo. The epitome of coastal elegance, this Ocean’s Edge Singer Island residence offers over 3,800 square feet of pristine living space. 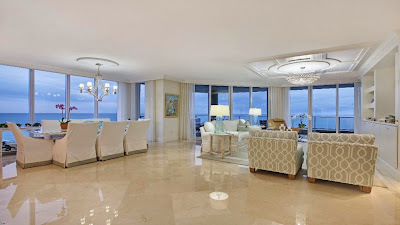 The effortlessly sophisticated interior boasts a number of lavish appointments including marble flooring, artfully crafted custom built-ins and walls of floor-to-ceiling windows showcasing a panorama of breathtaking ocean views. Additional features include a luxurious Master bathroom with his & her vanities and soaking tub, a gourmet island kitchen with upscale stainless steel appliances, 2 garage parking spaces and an expansive wrap-around terrace. 5050 North Ocean Drive #1001 is located in Singer Island and is currently asking $2,850,000. This Ocean’s Edge listing is courtesy of Island’s Realty MLS# RX-10131622. Ocean’s Edge is a breathtakingly beautiful condominium community located in Singer Island, Florida. Residents of Ocean’s Edge Singer Island enjoy an impressive package of 5-star amenities including 24/7 guarded entrance and monitored surveillance, concierge service, heated oceanfront pool, controlled access parking garage, meeting rooms, theater and fully equipped fitness center. In addition to an oceanside address, Ocean’s Edge Singer Island also offers residents a premier location just a short drive from The Gardens Mall, Downtown at the Gardens and Harbourside of Jupiter.